Yellowstone National Park. That is really all one needs to say to get the message across. What could very well be the most photographed National Park in the world needs no introductions. Yellowstone harbors all of the elements that make the “West” of the United States such a compelling area for photographers. 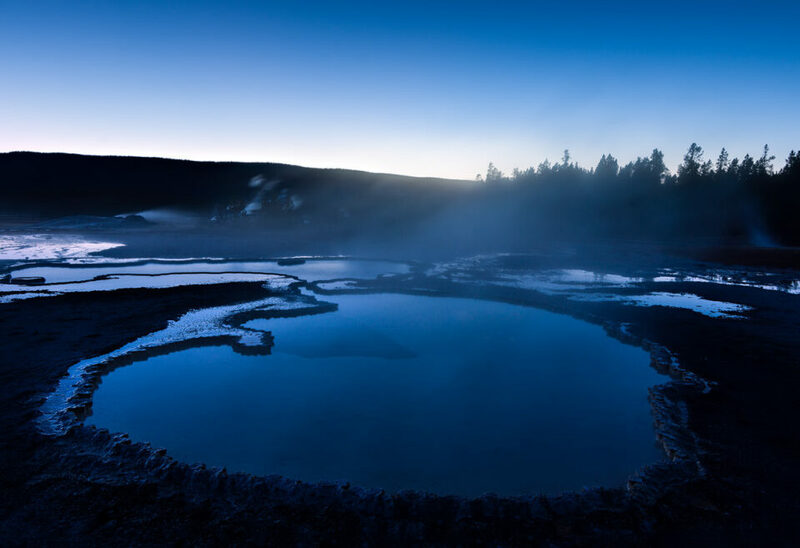 It’s combination of landscapes, geothermal activity and wildlife is a photographers dream. And yet, for a place with so many splendors, you would think I would not get so many questions on how and when to photograph massive park. For all it’s many wonders, Yellowstone happens to actually be a difficult place to capture properly, especially if one is to do so in a unique non kitsch way. The geothermal landscapes are restricted by boardwalks. The lighting is often harsh. You are often taking a photo with a hundred other people that are taking the exact same picture. And let’s face it, Yellowstone has been photographically chewed over and over again, making it a unique challenge to create something new. 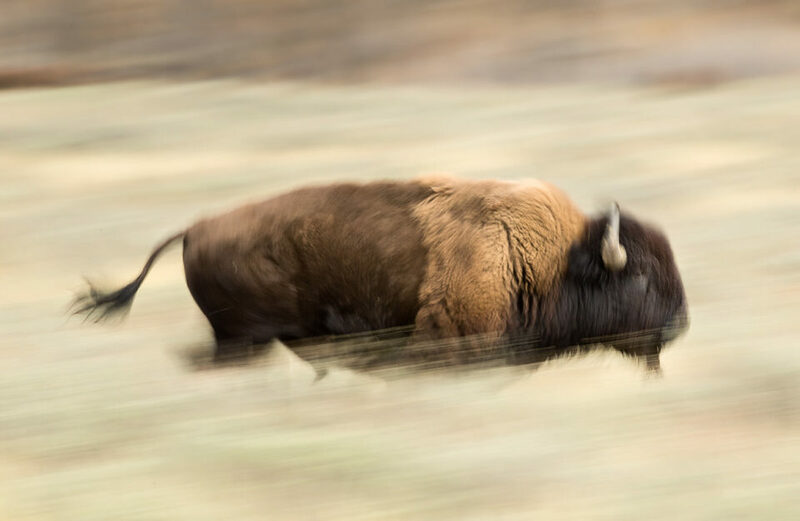 In this article, I will try to highlight how I personally attack the challenge of photographing Yellowstone National Park, and I will do so in a sort of one day itinerary in the hopes of answering some of the many questions that I get asked so often. 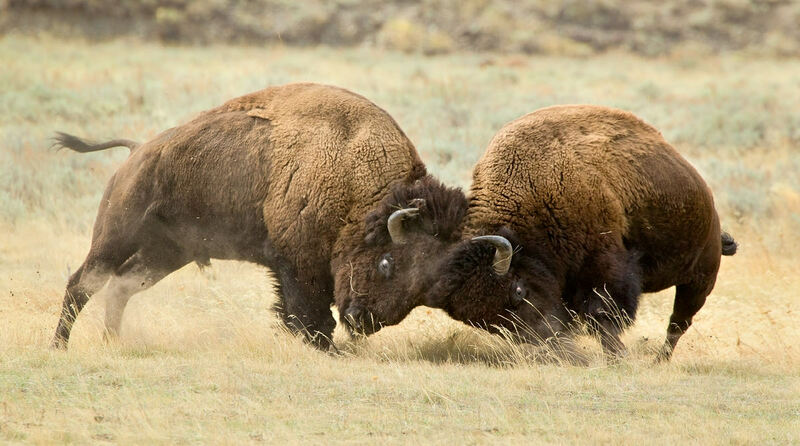 My first rule of thumb with Yellowstone is a rather simple one. Do not visit the park in the summer. There that is the rule. Oh you want a reason? Well the crowds are unbearable, the lighting is harsh, and wildlife activity is less pronounced. 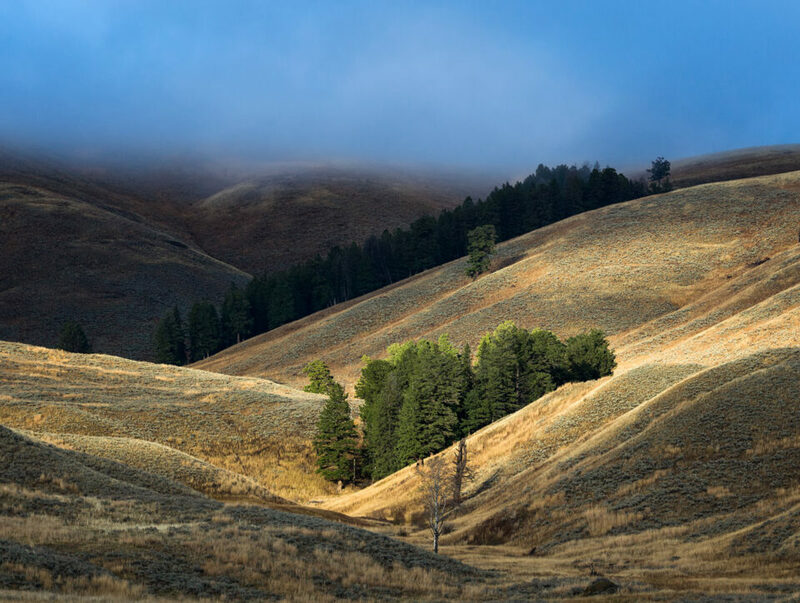 By far my favorite time to photograph Yellowstone is during the latter stages of Fall or during late September. The lighting is best, with the warm fall color palette perfectly contrasted by the ever increasing stormy weather that adds an element of intrigue to the landscapes. My mornings start at around 5AM, or around one hour and a half before sunrise. I try to be ready to go an hour before sunrise and will often be on the road long before there is any light outside. 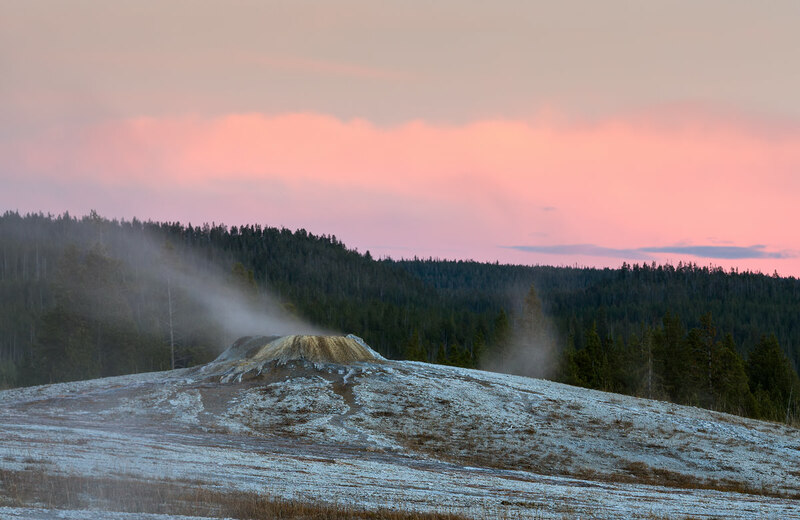 The beauty for landscapes in the early Yellowstone morning, especially during the fall months, is the expansion of the steam in the crisp cold morning air. 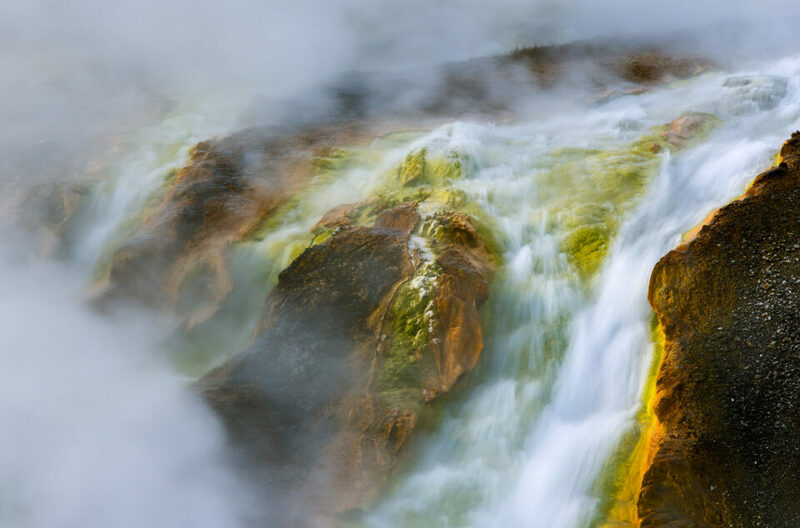 With each thermal feature sending steam right into the heavens, the whole landscape transforms into some surreal scene right out of a fairy tale. I try to select a specific basin that I feel works best during the morning hours (there are some that are far better later in the day), and make it my mission to spend the next few hours doing my best to capture the said basin in all it’s early morning glory. Which basin you choose is up to you, but I tend to prefer the smaller basins for they allow for more unique photos and maybe even a chance to take wholly unique shot (not an easy accomplishment in Yellowstone). While wide angles work well in the basins. I feel that the boardwalk heavily restricts the creative freedom and as such, I often go for my telephoto lenses (70-200) to help isolate my subjects. Another tip is that while lens flare is a very real issue, do not be afraid to shot into the sun during these hours. 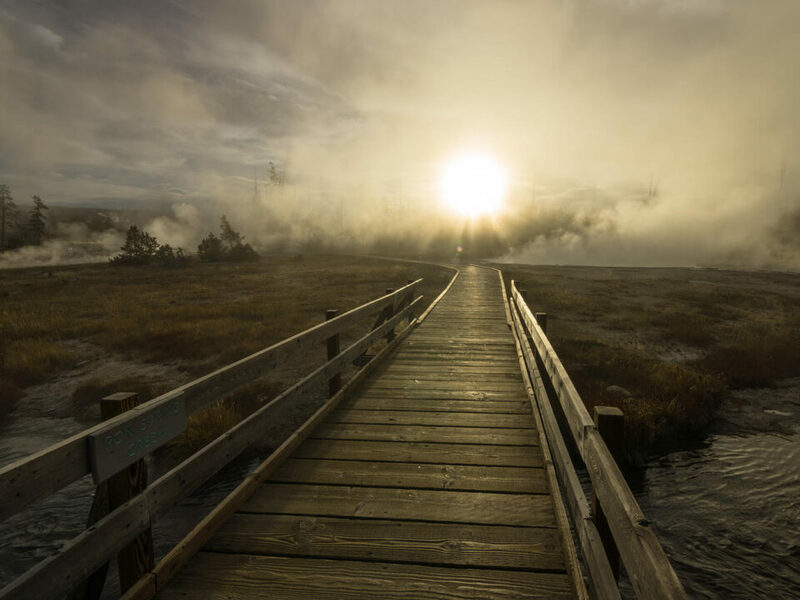 The combination of steam mixed with the rising sun can create a very absorbing atmosphere that really helps accentuate the sense of wonder so prevalent in Yellowstone’s landscapes. The morning hours are also fantastic for finding and creating great wildlife shots. Whether the morning is clear or overcast does not matter in my opinion. Wildlife can be photographed well in almost any weather, providing the subject is a worthy one. But sometimes the weather can add an element of intrigue on it’s own. 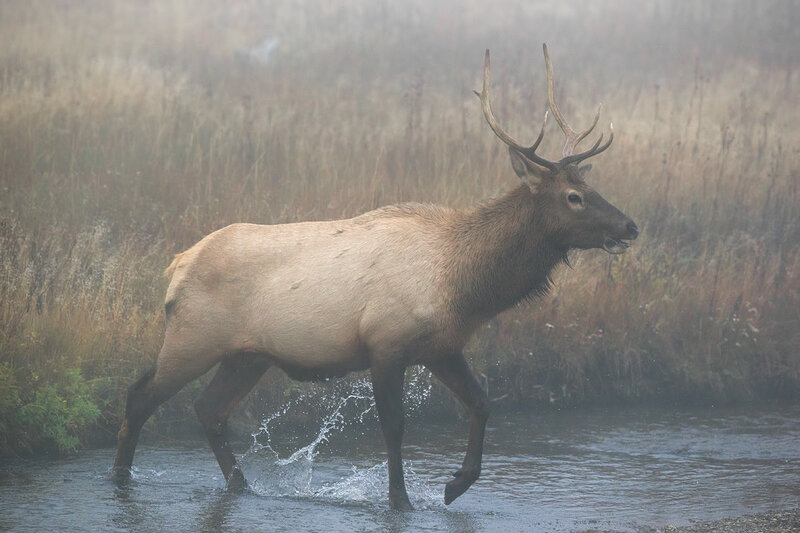 And in Yellowstone, the cool steamy mornings can help create wonderful wildlife shots if you can find wildlife around the thermal features. So you just spent a few good hours of the morning taking photos in pleasant light, but now come the dreaded midday hours. Photographers fear midday like the plague, and like trolls we turn to stone as the sun gets high enough with it’s powerful rays taking away all of the subtlety of the landscapes. And yet, not all is lost during the midday hours. 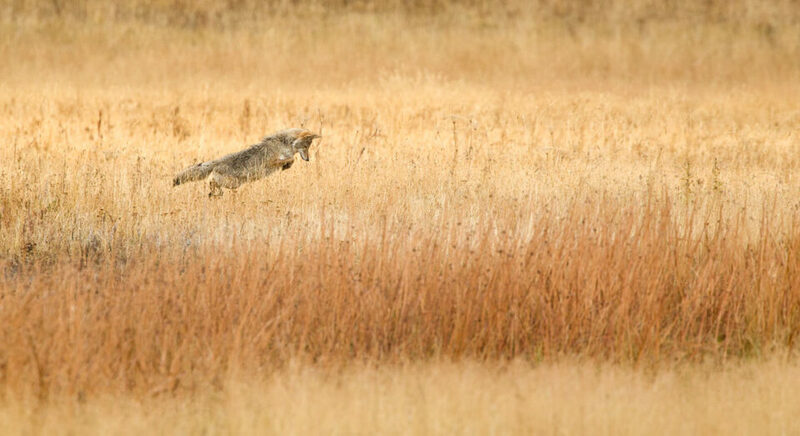 Quality landscapes can still be attained, and wildlife is still very much active during the middle of the day. Midday calls for even more concentration on minute details and for more intimate views. As such, the wide angle lens usually spends the noon/afternoon hours in the camera pack in favor of the tele-zoom range. I tend to concentrate mostly on wildlife during the middle of the day, but with enough luck and some nice clouds you can still capture beautiful views. I have taken some of my favorite landscapes during the central portion of the day as I was looking out for wildlife. 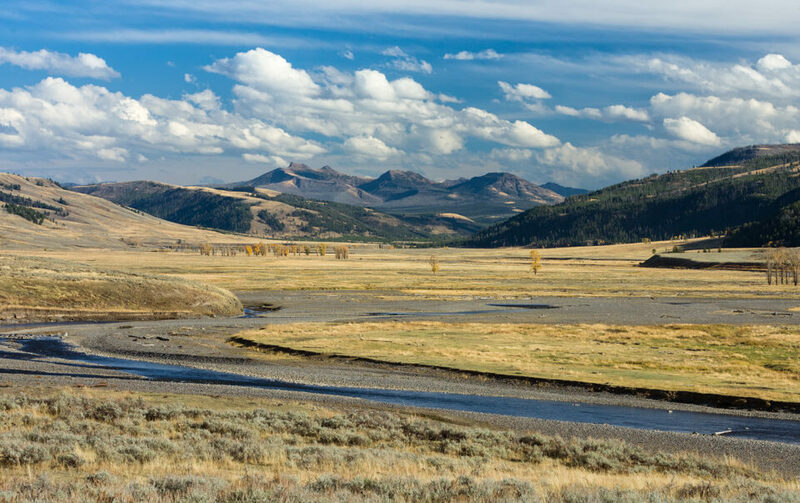 Lamar Valley in Yellowstone is especially wonderful for it’s combination of grasslands and rolling hills, all surrounded by beautiful mountain peaks. Remember to use polarizing filters, especially so during the middle of the day, for they really help add a bit of nice soft contrast to high contrast shots. Wildlife, especially the larger herbivores are still widely available subjects during the midday hours and this ability to spend a great amount of time with them should be utilized. So often do I see photographers stop for a few minutes and leave a scene without giving mother nature time to work it’s magic. 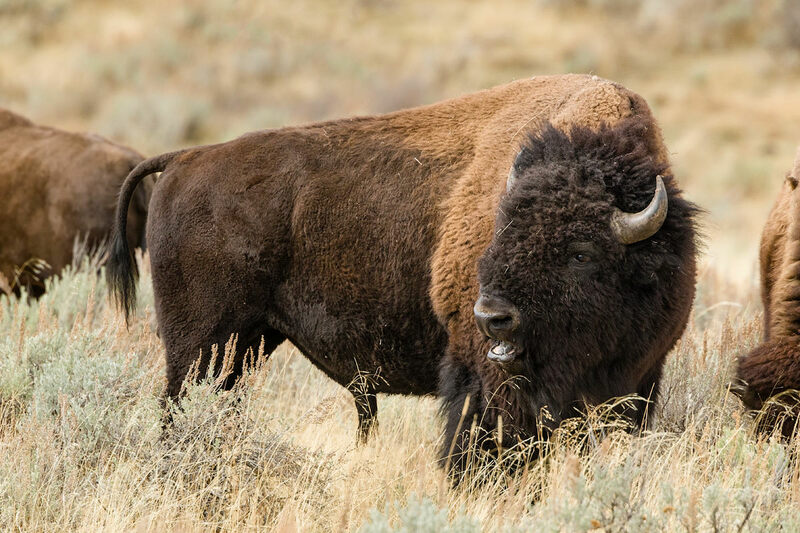 An example is the set below, where I spent hours with the herd of Bison, and what started out as rather simple Bison shots like this one. As the day comes to an end, my priorities again shift towards landscapes. I feel like some basins are especially beautiful during the afternoon/sunset and dusk hours. 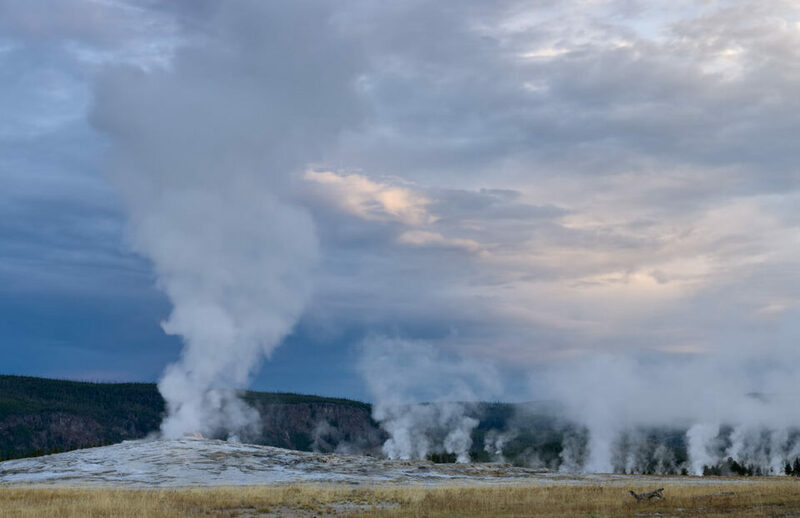 I especially like Norris and Upper Geyser Basins during dusk because they both offer simple and elegant compositions that really show off Yellowstone’s geothermal wonders. It is also during this time of the day that the wide angle and regular zoom lenses come out of the bag, for the great clouds that often come during the late day hours are best captured in a dramatic wide angle fashion. The telephoto lens is still very much useful during this time of day, especially if you wish to isolate one of the features. 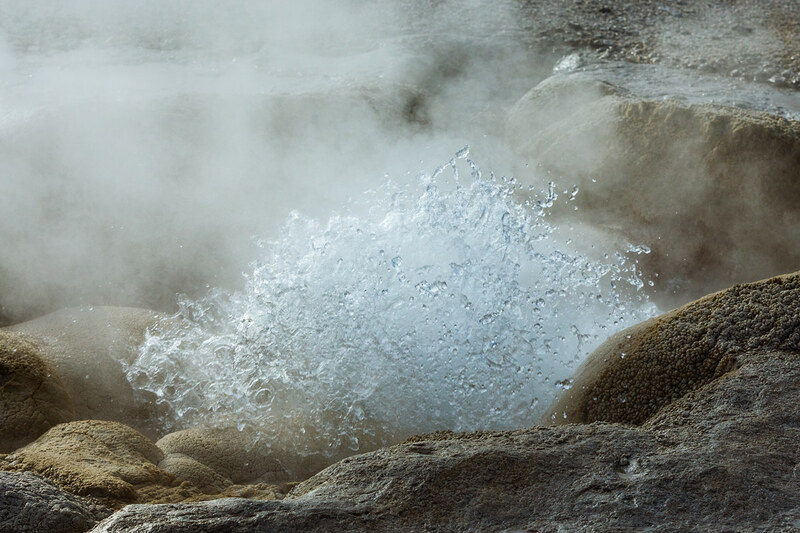 I recommend going around with two cameras rather then switching lenses, for the air is the geyser basins is a recipe for damaging your gear. 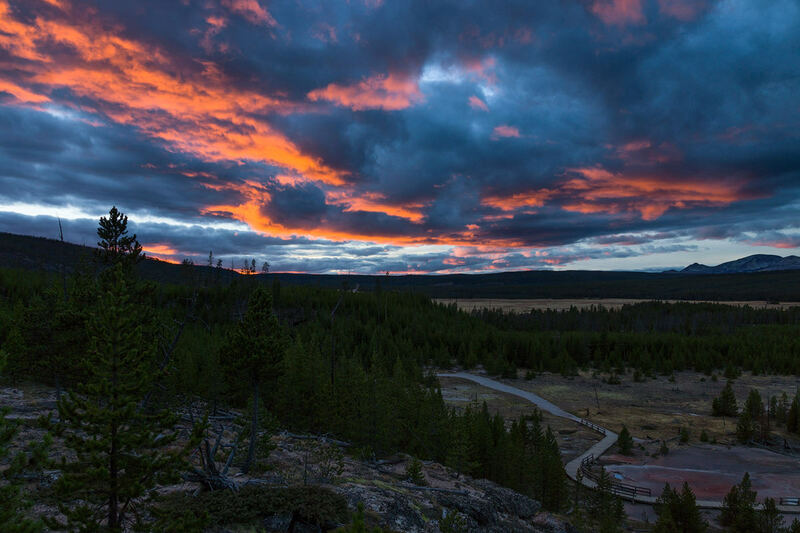 While sunsets will help bring the more dramatic color tones that can be had in Yellowstone. I prefer the colors at dusk even more. The air is very different in Yellowstone from what many are used too, and dusk’s are often extremely blue in coloration. An example can be seen in distant mountains. You will often see blue casts in photos of distant mountains, but that is an unnatural color cast caused by the camera and should be removed (I rarely see it removed). But in Yellowstone, the distant mountains often turn into an actually blue tinge during dusk. I tend to leave my white balance set to sunset during this hour to help extenuate the blues, if I feel the color cast get overly blue, I might change things to cloudy white balance. While many people go to sleep once the sun sets. My day is still not quite over. 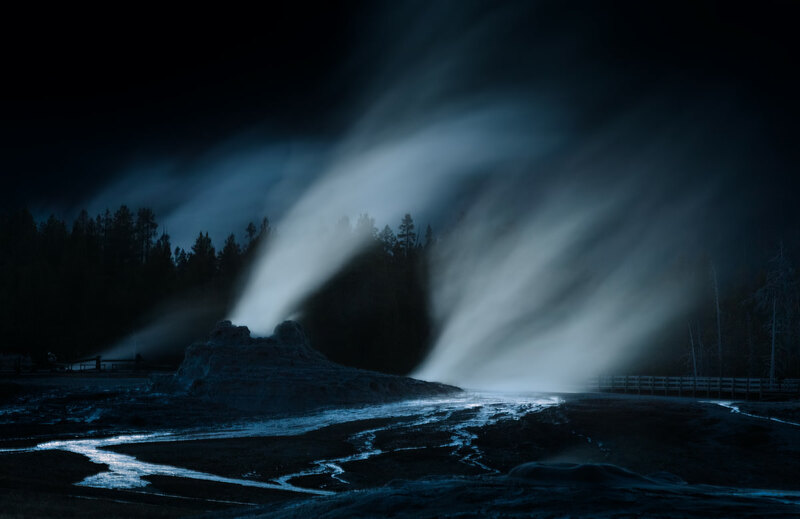 Yellowstone is a very beautiful place at night, and it takes a camera sensor, a tripod, and a remote shutter to fully show this beauty. I tend to keep track of all the major geyser eruption times so that I can set some sort of basic schedule. And I make sure to also keep an eye for nighttime eruptions. A good flashlight is incredibly important for nighttime shots, not only for its light painting ability, but also to aid in focusing and for setting everything up. This guest post was submitted by Dvir Barkay. To see more of Dvir’s work, please visit his website. Yes! I do the same time period too. Many photographers miss the unique shots not doing it in the spring/autumn times. Great article. Yes it is a wonderful time to go, wonderful colors. Thank you for the kind words. Literally, first experience getting to the park was seeing the entrance sign and a few people was there so my wife and I waited turns as the others did to take our pic while suddenly a bus came by with lots of tourists and this old woman just pass everyone and stood next to the sign to get her pic taken! I mean, if it was some little kid but come on…a freakin old woman should have some manners. After saying a few curse words I walked back to the car pissed off. I was already upset because going to a grocery store this old tourist male was just rushing bumping into people and bumped into my wife and didnt even bother to excuse himself…is like this is normal for them. I wanted to give him a reality check but my wife stopped me. So later on, while taking photos from one of the Falls viewing areas, I was standing there focusing when this mature tourist female just stepped right in front of my camera to take her pics with her stupid tablet! I moved right next as she tried to once again invade my personal space I welcomed her with a nice left elbow check. I was really about to snap at the time!! Sorry to any visiting tourist reading this, but this was over and over with the tourist buses arriving not just a single incident. Overall….I did my best to enjoy the vacation but wow people can be just completely stupid. Not to mention people ignoring the warnings about approaching wild life etc…..humans are not high on my list of prefer creatures..
Two years ago, taking pictures of one of the volcanos in Hawaii, I was the only person with a tripod. Most people were nice and gave me room until a tourist bus came. Though there was plenty of space elsewhere, they would crowd me and hit the tripod legs at times. I finally had to say watch out and suddenly they would see me. I think their culture is simply that they don’t watch out for others and part of it is the dense population they are from. It is every person for themselves. It is cultural and there is nothing we can do about it. Gabriel, You are NOT racist at all! That’s how things are in the World in general. I found the same mobs in Paris, Louvre, Versailles where ‘hordes’ of tourists had ignored anybody in their way ….no, I am not sorry to tourists who will read it at all. They must be told how the others see them behaving badly. I hope Photography Life promptly deletes this comment as it clearly violates the Code of Conduct 1. I replaced some of the words in the text instead of deleting comments – I think it works. 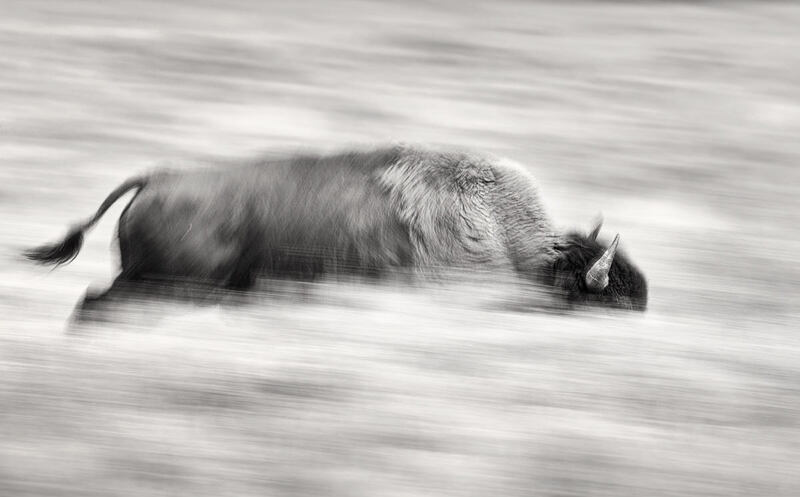 Good article, great photos of Yellowstone. Unfortunately, the digital photography we love has led to the digital photographers we hate. At the Monterey Aquarium in California the best shot I got all day was of about 25 arms extended into the air as 25 people were all trying to get photos of an exhibit no one could actually see because of the crush of people. My experiences in Yellowstone, Grand Canyon, Yosemite and other places are that if a tour bus pulls up they all seem to think the fact that they paid the tour bus company for the tour puts them ahead of anyone else when it comes to taking photos and pushing and shoving and getting in the way is their right. The number one rule Mr Mansurov gave us is correct for many National Parks – don’t go in the summer. Sorry, it was Mr. Barkay whose rule is don’t go in summer. Not to justify this ill behavior, but tour bus stops are short and drives are long. The inmates are both bored and pressured to do what they can on their brief stops. To understand all is definitely not to forgive all, but it goes a short way at least. Personally I enjoyed shooting the bus tourists crowding the brutalist Mather Point Overlook in GCNP. It’s a strange contrast. And they were having such a good time! I find that tourists of all sort are drawn to a tripod shooter like flies to a cow flop. They think the tripodist is seeing something they aren’t (probably true) and believe that they can get the same shot if they crowd him/her enough (almost certainly false). These are the ones that annoy me. On the other hand, “We have met the enemy and he is us.” I’m sure others look on us with our big cameras and tripods somewhat in the same way we look on those we call “tourists.” What makes us not “tourists to others?” In some of those crowded situations I’ve seen photographers with cameras, tripods, etc. spend a long time photographing (hogging) an area, taking the same photos over and over while those “tourists” are forced to stand on tiptoes to see over their equipment. Usually, it just pays to be courteous no matter who you are. Seriously, my wife and I hate crowds so we avoid them. 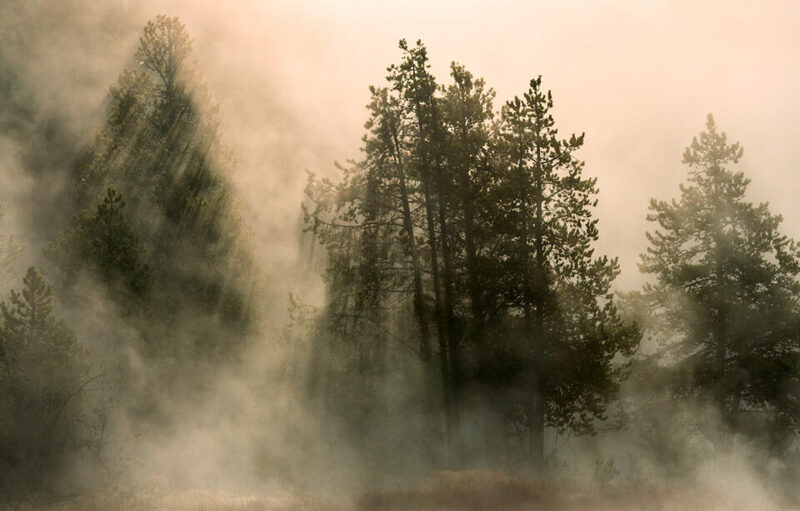 We might not see “Old Faithful”, but we and you will see equal and often unexpected wonders hiking little used trails in little used areas, even in overcrowded parks like Zion, Yosemite or Yellowstone. As an added plus, behind most of the trees and bushes on those trails are our own, private urinals. For other toilet functions be sure to bury your toilet paper or find a good size rock to cover it with. For safety in little used wild areas be sure to hike with a partner or let somebody know where and when you’ll be hiking and returning so that something as simple as a badly sprained ankle doesn’t end up life threatening. Also stay on trail and carry the hiking 10 essentials ( ). Enjoy! You and your wife must have had “Please be RUDE to me” taped on your backs. Maybe next time will be better for you. Try to go at a “Non-Peak” time and hopefully that will help. Nasim, logistically where do you stay or camp when you go to Yellowstone? I would think that Jackson is too far away from Yellowstone for those early morning travels? Jay, I always stay in one of the campgrounds inside the park – makes it easier to get to spots. Jay, there are nine concessionaire-run lodgings within the park, and reservations are easy. Lake Hotel has rooms available right now, Fourth of July weekend, according to the NPS website. Old Faithful Inn, built entirely of logs in 1904, is a hoot. All walls are log! The massive lobby is a photographer’s paradise. Rooms have furniture designed by the architect. Awesome photos, thank you for the post. I have yet to be able to make it to Yellowstone. It is on my list of places to go, just not sure when. I will definitely make note of your tips and suggestions though. Again, thanks for a great article. Glad it could be of some help. I can do more in depth articles of specific locations and basins down the road if it is of any interest. Specific locations and basins would be very useful for planning! Thank you for sharing. Probably controversial to write this, but I’d say most professional photographers, and even non-professional photographers like myself, don’t like to get too detailed about “specific locations and basins” where they go to take their photographs. Some photographers earn their living by knowing where those places are and acting as guides for people interested in photographing them. I’ve been to Yellowstone with a professional photographer who earns his living in part by taking people on trips to Yellowstone and other national parks and he definitely knows the good photo locations. If I go to an area by myself, not having been there before, I might find a good spot or get lucky, but would waste a lot of time looking. If I go with him I know I will get some good shots. I feel it would be a kind of betrayal if I were to start publishing locations he took me to. I’m sure others disagree with me but that’s the way I see it. That is an interesting topic of discussion. Indeed I make my living off my photography and there are certainly some special locations in Yellowstone that it will take quite a bit to get it out of me haha. But Some of the more major basins and locales that everyone visits I would be happy to give some advice on how to attack them in a more unique way. Thanks very much for the article, which is particularly interesting to me after 2 failed attempts of mine to visit that place. It is now on my shortlist, either for this fall or the next. Glad you liked it. I would indeed try to visit in the Fall time period, it is the most wonderful. Thank you for the wonderful, inspiring photos. Looking at them is a total pleasure. Thank you for the kind words, appreciate it. I presume you have also been to the Grand Tetons during your visits to Yellowstone. 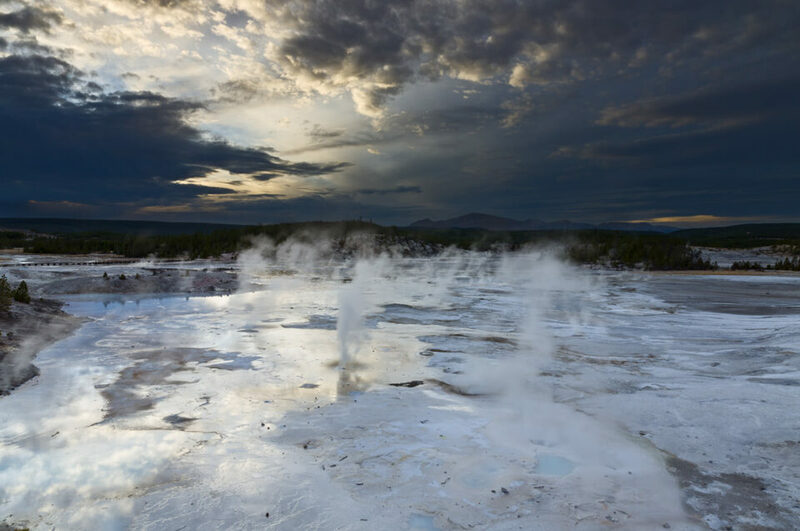 If so, how about a post from there to complement your very nice Yellowstone images. If not, be sure to go. Lots to take there as well. Believe it or not I was there when I was young but have not been back. When I am in Yellowstone I get so caught up in the thermal regions and wildlife that I usually have little time left for anything else. If/when I do go I will be sure to post an article! You might want to give credit to Steve Perry for his idea for Death from Above. I have never seen that one before, cracking shot. Sill not sure I understand the original commenters general idea but anyhow, thanks for bringing up that shot. Taking out rude tourists? A use for reincarnated Velociraptors? As a person who strives for fun and serenity, I’d advocate just avoiding crowds and tour buses. My wife and I visit beautiful natural areas off season (not always possible if you take family vacations with kids), or less over popular areas. I agree with the person above who advocates being helpful and kind to tourists, but not spending the day with them. @Judith – certainly not original with Steve Perry. Great shots, Dvir. Thanks for sharing your experience. Wonderful article. I was at YS a few years ago in late August and I wish I did more early and late photos. It was crowded but I did not have any difficulty with the tourists. The Grand Teton area is a must see and there are far less crowds. We also took the Bear Tooth highway in the northeast. It is at a high elevation – difficult to breath – but great views. One point – if you go off the main areas, bring bear spray and travel in groups of 3 or more. I worked in Yellowstone one summer during college. 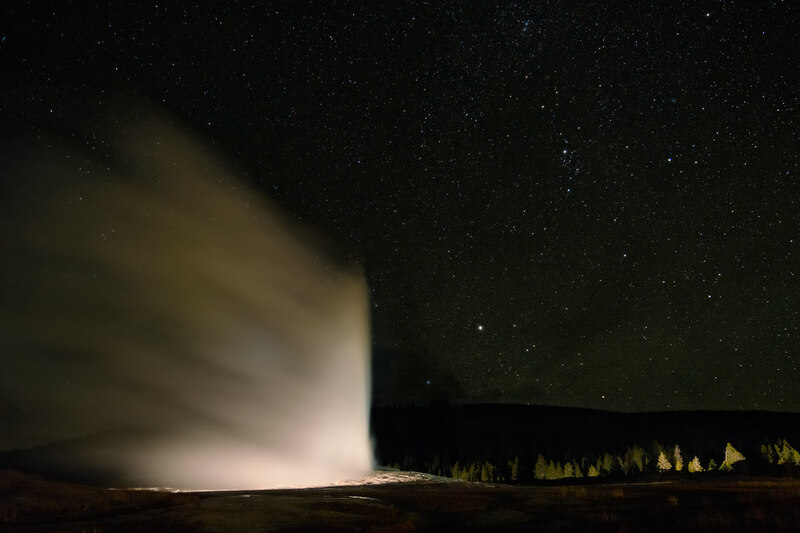 Yes it is accurate to say that the crowds are overwhelming at the popular sites like Old Faithful. Just walk a half mile from the popular viewing areas and you are away from the crowds. Most tourists want to see the highlights of the park as the stay one or two nights and do not want to walk away from their cars. Spend a week or more and you will see everything you could dream about.